August is a rich foraging time and we recently took a break from mushrooming to make a second visit to our favoured Bilberry spot in the Cambrian uplands. 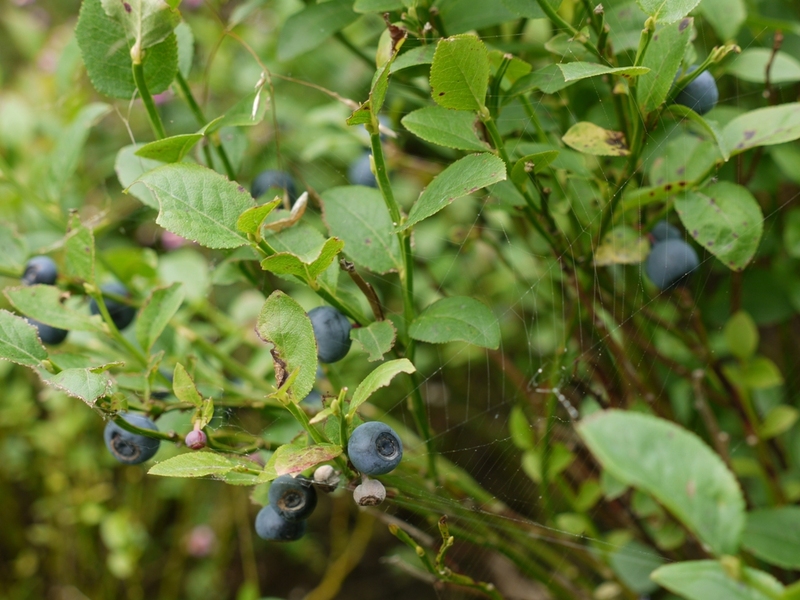 Bilberries (Vaccinium myrtillus) are the much smaller and tarter wild relative of the supermarket Blueberry (V. corymbosum) a cultivated form of the wild North American species. 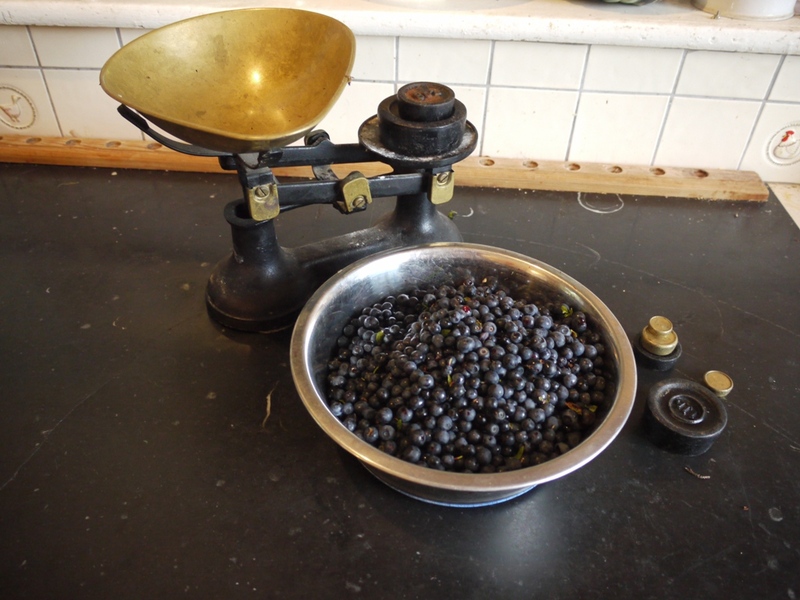 When I was a child, blueberries were unknown in British shops and so bilberry picking was a seasonal tradition, the whole family crouched in the heather and scrub, fingers purpling as we picked off the berries, squishing the overripe ones as we picked. It is a tedious task, as few berries are as much as a centimetre in diameter, and while the largest, ripest ones tumble far too easily through one’s fingers, the slightly less ripe ones cling firmly to the bush. Unless there is a strong breeze, a horde of buzzing flies soon circle around the picker, and horseflies converge from great distances upon a likely blood meal. But the outcome was a cascade of small spherical fruit baked with sugar and perhaps some apple in a pie topped with shortcrust pastry. We liked to compare tongues after a bilberry pie, for the purple pigment stains the skin, and a tongue would remain blue for at least a day after the meal. Once you have had a bilberry pie, blueberries will always seem watery and insipid – a pale imitation of these mountain fruits. Finding a good Bilberry spot is a matter of luck and close observation. At best the shrubs grow as loose bushes about 18 inches tall, but often their growth has been accompanied by regrown oak woodland, and they do not fruit freely in the shade. 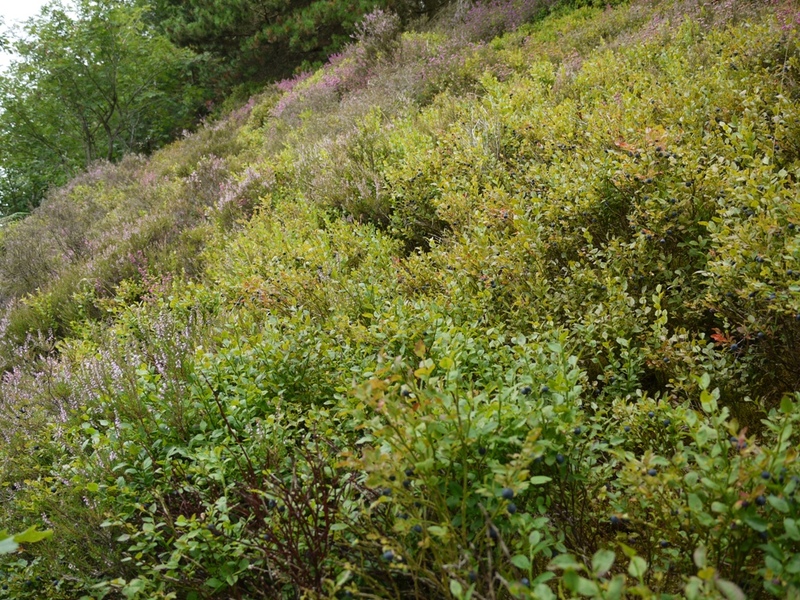 On sunny hillsides they grow densely with heather (Calluna vulgaris) and form a low growing carpet of green and purple. Grazing and hill fires both hold back the size of the bushes and the fruit may be smaller and sparser. Most of the best spots are probably on forestry land where there has been little or no recent grazing but the trees are few. Our two man-hours of picking yielded two and a half pounds of fruit which will freeze from fresh into perfect little black spheres of shot. Neither flavour nor texture is diminished by the freezing process and I will later layer them with bramley apple and sugar in a generous pie. If half the health benefits attributed to the milder blueberries apply to these wild fruit then we are also protecting ourselves from the ravages of senility, stroke, heart attack and macular degeneration of the eyes. And of course the physical exertion of climbing the hill will have also been very good for us! My blogging regularity has diminished recently, so what is my excuse? Well part of it is the pleasure of foraging to fill the freezer. Lines of mushrooms press up through the new grass. 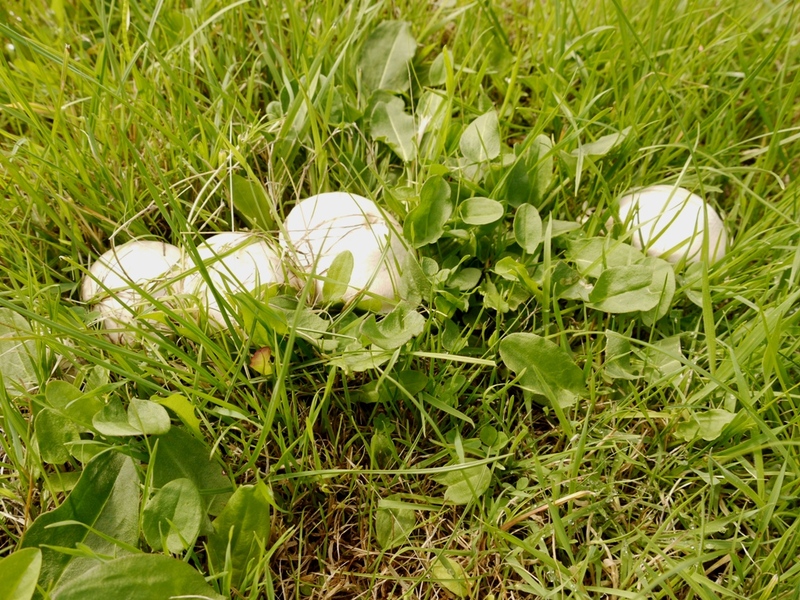 Real wild field mushrooms have suddenly burst forth in our field. They are the most unpredictable of crops. In 2011 we picked half a carrier bag-full every few days for several months starting in late May. By contrast last year’s rainy and vile summer yielded not a single one. And throughout the baking hot days of June and July this year, the hay crop grew up, was harvested, and the new grass began springing from the roots. There was not a mushroom to be seen. 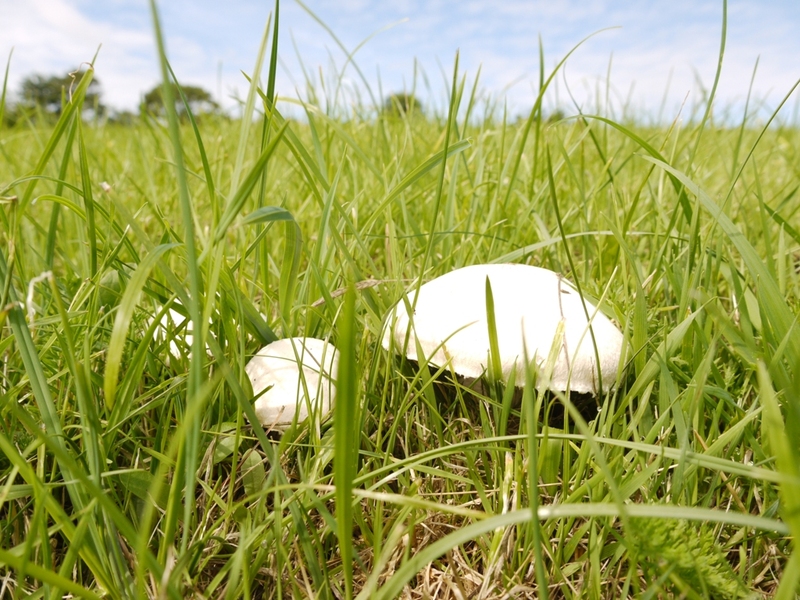 And then this week, after several refreshing bouts of rain the mushrooms are emerging, gleaming white chains of domes pushing up through the grass and herbs. 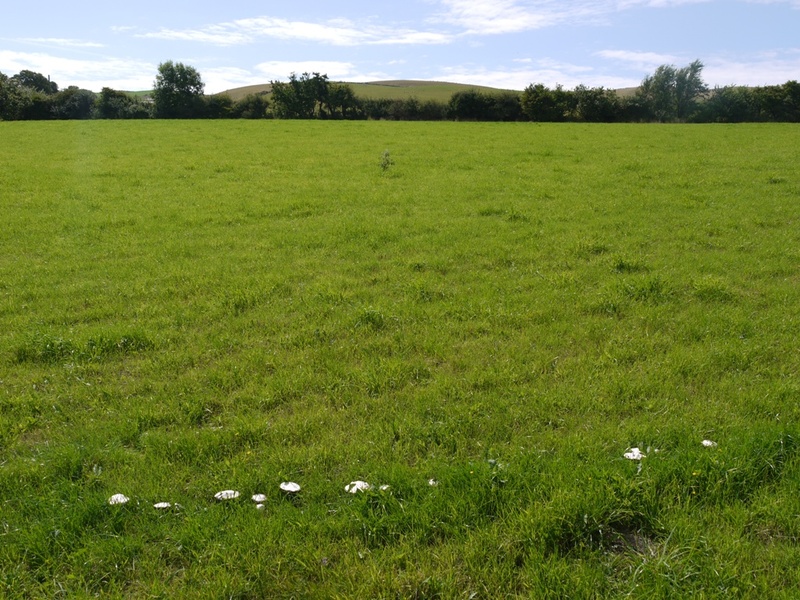 They form distinct colonies, reflecting the spread of the mycelium below the ground, and in many cases the colonies have spread out into partial ‘fairy rings’: large arcs of emerging mushrooms in grass which is growing slightly richer and greener than the rest. Walking across the rising ground one can pick out these darker green strands of meadow, and on closer approach, find the mushrooms sheltering within them. Darker green grass marks the margin where two separate sets of mycelia meet and the fruiting bodies emerge. When we bought our field some twenty years ago it grew a deep hay meadow of coarse grasses, cocksfoot and timothy which one waded through with difficulty before the cut. The farmer in those days would apply chemical fertilizer each year to promote the hay, and graze the field with winter sheep. There were few wild flowers and no mushrooms. Under our management there is no chemical fertilizer, just a traditional sprinkle of farmyard manure after the sheep and lambs have grazed it bare in spring. And over the years the tall grasses have disappeared, and a species-rich meadow has re-established itself. The hay crop looks pretty substantial when rolled up in big bales, but even at harvesting the vegetation is now little more than ankle deep, low enough that a strolling free range chicken can look out over the grass heads on alert for the fox. It is a richly flowery mix with vetches, daisies, clover, plantain and other herbs. A gourmet diet for sheep, which, as is well known, much prefer a mixed and varied forage. Most of the mushrooms, I trim and wipe free of grass and gently bag them up for the freezer. A frozen mushroom obviously loses its firm texture for mushrooms on toast, but so does a mushroom which has been slowly stewed. All through the winter I add frozen field mushrooms to richly winey coq au vin or boeuf bourguinon, layer them in meat pies or add them to soup. The commercial mushroom is a pale tasteless echo of the real thing. These mushrooms pack a punch of flavour. 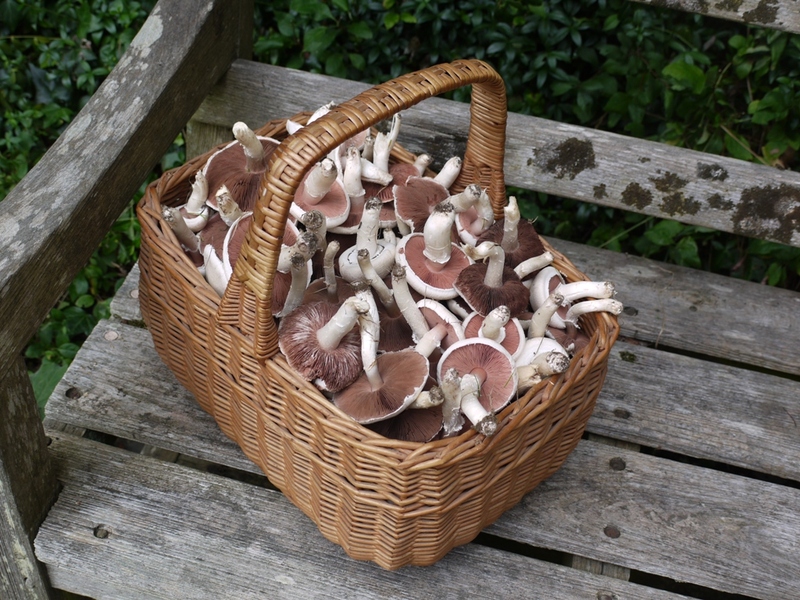 A half hour stroll yields a brimming basket of mushrooms.